A new report from the anti-poverty group Oxfam has helped put inequality back near the top of the global agenda, just in time for the World Economic Forum’s annual gathering of global elites in Davos, Switzerland. In particular, one striking claim from the Oxfam report has generated headlines: By next year, the top 1% of the world’s population could own more wealth than the other 99%. The Oxfam report – just one of many attempts at measuring worldwide economic disparities – fits into a broader pattern of growing interest in, and concern about, inequality. It’s certainly a topic on the minds of average citizens around the world. 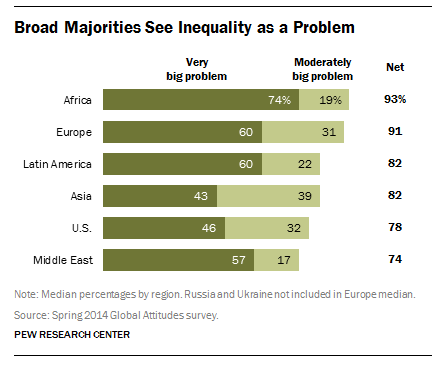 In a spring 2014 Pew Research Center survey, majorities in all 44 nations polled described the gap between rich and poor as a big problem for their country, and majorities in 28 nations said it was a very big problem. Concerns about inequality are most common in Africa, although they are widespread in wealthier parts of the world as well, especially in European nations such as Greece (84% very big problem), Spain (74%) and Italy (73%) that were hit hard by the Great Recession. Inequality is also a high-profile topic in the U.S., where President Obama called for higher taxes on the rich in his State of the Union address. Americans across the ideological spectrum see it as a big problem, including majorities of Democrats (89%), independents (77%) and Republicans (60%) in the spring 2014 poll. However, the view that inequality is a very big problem is much more common among Democrats (59%) and independents (49%) than among Republicans (19%), and there is a big partisan divide over how the issue should be addressed. Globally, the elites are worried about this issue, too. Pope Francis, the French economist Thomas Piketty, and others have stirred up the global debate on economic fairness over the last year. And a World Economic Forum report from last November ranked rising income inequality as the number one trend facing the globe in 2015. Based on a survey of 1,767 international leaders from business, government, non-profits and academia, the study placed inequality above other challenges such as jobless growth, the rise of geostrategic competition, and the weakening of representative democracy. According to the BBC, 80 billionaires will attend the confab in Davos. So will Winnie Byanyima, executive director of Oxfam and co-chair of the World Economic Forum’s 2015 annual meeting. Upon the release of her organization’s report, Byanyima was quoted asking “Do we really want to live in a world where the 1 per cent own more than the rest of us combined?” It is a question that will reverberate throughout the meeting halls of the Swiss skiing village this week, and as Time’s Rana Foroohar has suggested, it is likely to be the dominant global economic issue in the coming year.